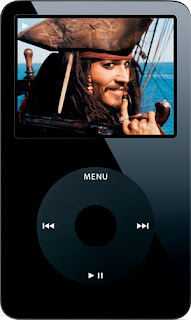 Its exactly been three weeks I have owned this 80gb raw entertainment; an iPod Black Classic. If you have been a regular reader of this blog and have read the older posts: Out of dilemma and iWars, you might be awestuck what motivated me to own it? Well, the radio stations are no more interesting to listen, unlike a few years ago. Whenever, I tune into any radio station, I'm forced to listen the most bugging or annoying song: Jhoom baraabar jhoom or E murdon ka shaher! How awful would it be to listen to 'E murdon ka shehar' on a monday morning while you are stuck up in a sickening jam? Moreover, the RJ's have lost the creativity to hold on listeners for a long time. Over 9 Radio Stations so far, most of us keep changing the channels very often. Having installed iTunes 7.4 and happily transferred songs upto 2gb. Even then, 72 gb space was free. Hence, I decided to transfer few movies. How can I forget the HP series? I tried transferring using Real Player and iTunes. Both didn't work. A friend suggested a link. When I downloaded and converted the movie file; the movie of length of upto 5 minutes was converted as it was a trial version :(Later, Sudipta, who had been owning 30gb iPod past few months gave me few links out of which many were trial versions and finally, we managed to download the converter which could convert movie of any length :D Thanks, da! I, finally, bid an adieu to my old Transcend mp3 player. Now with my iPod, I can enjoy a movie everyday while travelling in the bus. With a video iPod, who cares a radio? Yeah trust me, its an awesome thing 2 have.. I have been using it since last 8 months and if u have ur fav things in it, u dunt need anything else. Welcome 2 d world pf apple. Oh yeah it is addictive... and I wish I had one of those when I used to take an hour in the bus to reach office. @ Sudipta, I'm already addicted :( Oh, what happened to your iPod?